Africa is charting a new path towards a single continental market and it will be an economic revolution. But what is the CFTA, and how will a single market solve Africa’s economic ills? According to the African Union, the CFTA is a project to bring together all African countries, comprising 1.2 billion people and a combined GDP of more than US$3.4tn, under a single continental market for goods and services, including free movement of businesspeople and investments, and expansion of intra-African trade. “The CFTA could increase trade between African countries by as much as $35bn, an increase of more than 50per cent from current levels.” What’s more, it will make Africa the world’s largest free-trade area in terms of member states. Here’s how the single market will pave the way for a remarkable transformation in Africa’s economy. There is ample research that validates how impossible it is to achieve economic development without trade. As such, it is an impediment that Africa does not trade enough with itself. The only way to improve the current dismal levels of regional trade is to disrupt all the existing barriers on the demand and supply sides that limit its rapid increase. According to Oby Ezekwesili, former vice president of the World Bank’s Africa Division and co-founder of the anti-corruption NGO Transparency International, only a single market model has the enormous potential to deliver such a massive scale of disruption and, ultimately, place Africa on the route to economic prosperity. The single market has the potential to push regional trade levels up from 15 per cent to 25 per cent within a decade, which will, in turn, exponentially increase the continent’s annual economic growth, create wealth more inclusively and reduce poverty. Aviation contributes $72.5bn in GDP to Africa, and supports over 6.8 million jobs. This is in spite of the challenges that abound in the 54 countries, in dealing with 54 different civil aviation authorities and 54 sets of rules regarding travel, trade and tourism. Leaving aside the difficulty of doing business, it can be a nightmare even travelling from one African country to another in the face of all this red tape. Imagine the massive gains if all of the 54 sets of rules were collapsed into one regulatory framework that allows the movement of goods and services in one singular market! 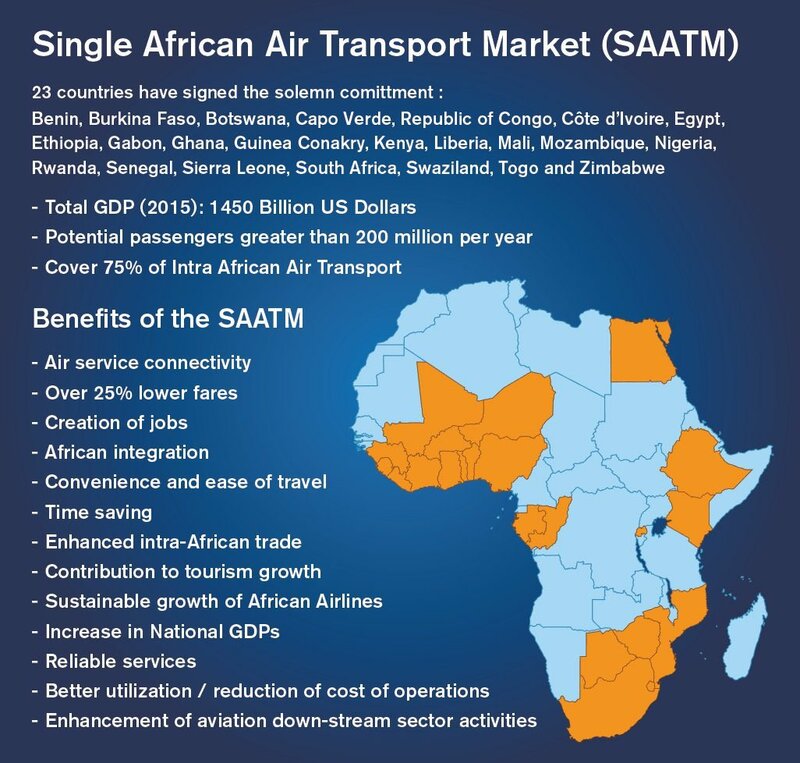 Fortunately, the African Union has just unveiled the first phase of the Single African Air Transport Market in a bid to untangle intra-African air connectivity. This development, notes Segun Demuren, the managing director and CEO of the Lagos-based EAN Aviation, will turbo-charge African aviation through improved market access across the continent. A 2014 study by the International Air Transport Association shows that implementing these changes in just 12 key markets out of the 54 would provide a potential five million extra passengers a year with unrestrained opportunities to travel and trade. It would also create an additional 155,000 jobs and potentially increase the GDP of those 12 countries by an additional $1.3bn. That’s just a quarter of the countries. Imagine the impact a single market would have across the continent. If the central goal of the single market is to jump-start the continent’s economic prospect, then tariff reduction or a total elimination of custom duties on imported goods from within the continent is a necessity. By recommending these measures, the CFTA presents the hope for a more stable trade regime, continental market access and huge increase in the rate of investment. This is because the CFTA will trigger trade liberalisation, an imperative catalyst for economic prosperity and sustainable development. As stated by African Economic Outlook’s 2017 report: “Trade between African countries has the greatest potential for building sustainable economic development and integration.” It will not only increase the scale and rate of mobility of persons, businesses, goods, services and capital across and within Africa. It will also create higher-wage jobs, catalyse economic evolution and unlock greater business opportunities. With all this, the McKinsey Global Institute is right to characterise African economies as “lions on the move”.